Oh. Hey, how’s it going? Enjoying the end of Mists of Pandaria? Leveling a lot of alts, are we? While Patch 5.4.2 wasn’t a major content patch, it marks a good point to take a look at the middle of this long end-of-expansion period and see how classes are doing in World of Warcraft. This data follows the same methodology of my previous census posts (previously, previously, previously, previously) in that it is snapshotting census data from Realmpop and World of Wargraphs, then analyzing that data over time. All data is available in my Warcraft Class Distribution – Mists of Pandaria 5.4.2 Google spreadsheet. Previous versions are linked in the previous census posts. Go ahead and open up the spreadsheet in another window, and let’s get started. The expected flow of an expansion is that players will level their main characters to endgame first, with alt characters following later on as time permits. The final content patch of an expansion allows many players to focus their attention on other characters after completing the final raid, resulting in people leveling alts. My theory is that we should see a more even distribution of classes as the expansion ages and players level those alts. In general, I think we’re starting to see that. The 6 point disparity between Paladins/Druids and Rogues/Monks from the beginning of the expansion has lessened. Monks and Rogues have both gained a point, Paladins and Druids have lost a point, but everyone is starting coalesce around the 9.19% mean. The one exception to this rule is Hunters; the Hunter class continues to steadily hold at 11.5%. My guess is that the Hunter class continues to be friendly to new players, Hunter mains, and folks leveling alts, so we aren’t seeing any drop off there. 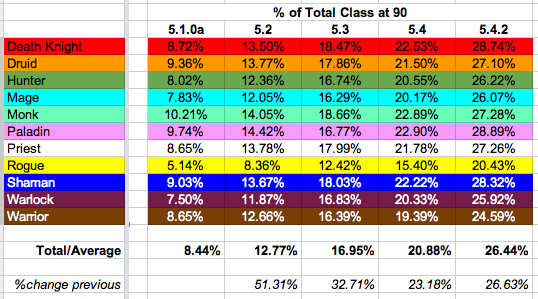 The chart above is the percentage of a class which has leveled to level 90, which gives us an insight into the overall health of a class through the leveling process as well as who people picked for their initial mains in Mists of Pandaria. Hybrids tend to level to 90 more frequently than Pure DPS classes, so we can evaluate them in two groups. Hybrids (tanks, healers, DPS) tend to all be around 27-28.5%. Hybrids who can perform all three roles (Druids, Monks, Paladins) aren’t really that different from those who can perform only two roles (Death Knights, Priests, Shamans, Warlocks) in this respect, with one exception: Warriors. Warriors continue to be the least leveled-to-endgame hybrid class, and are the second least popular overall. Considering the class which overlaps them the most (Death Knights) is the second highest on this chart, that continues to be alarming. Pure DPS tend to all be around 26%, with one exception: Rogues. Rogues are still the least leveled-to-endgame class, continuing the trends we saw in 5.4. There’s been the same slow improvement as before but it really seems to be a niche class for both mains and alts. We’re now seeing a consistent trend throughout Mists – players are not choosing to play Warriors and Rogues at the endgame. If you look at the overall population figures you can see that Rogues are much more represented in the 10-85 pool – 8.85% – but then they fall off dramatically in the 86-90 range and never recover. Interestingly, Warriors do not have this drop in population – instead, they’re just an unpopular hybrid at all levels (compared to other hybrids). Without substantial changes to the class play style or a substantial carrot offered to players of these two classes, I don’t see any real substantial changes for Rogues or Warriors until the next expansion, Warlords of Draenor. So use this data cautiously. Think before you jump to any conclusions with it. 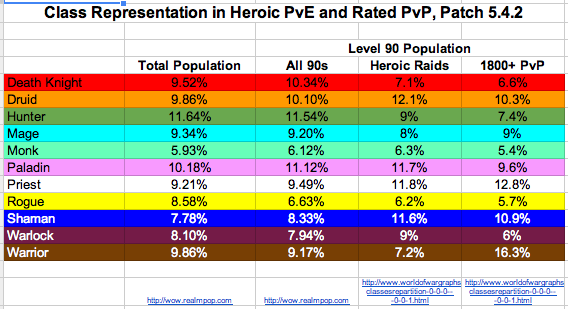 Here’s the total population vs endgame vs PVE vs PVP chart. The general idea behind this one is to point out areas where a class might be over or underrepresented in an area of the game relative to its overall endgame population. Paladins, for instance, are 11.1% of the endgame population and 11.7% of the heroic raiding population – relatively balanced. Priests, on the other hand, are 9.5% of the endgame population but 11.8% of heroic raiding and 12.8% of the ranked PvP data set. They are performing very well at the hard stuff. Death Knights, Hunters, and Warriors are less represented than their general endgame population. For DKs and Hunters my guess is that they are excellent classes for casual players as well as experts, so they are overrepresented in the endgame pop and underrepresented in heroics. Warriors are a different matter. Mages struggle a little bit in heroics. Rogues struggle in PvP. Shaman and Druids seem to be doing very well in heroics. Warlocks seem to have a bit of an edge with mechanics in the current raid tier and have solid representation as well. Warriors and Priests are doing amazingly well in PvP. The details for each class can be found on the PvE and PvP tabs. Digging into the specs (PvE, PvP) shows us some interesting tidbits, like Arms and Holy are doing great in PvP, Destruction Warlocks are dominating in SoO (due to raid mechanics, I assume?). But we also have a complete enough data set that we can start plotting Spec Popularity over Time, at least for heroics and rated PvP. You snapshot data enough times and finally you can do some visualizations with it. I’ve divided the spec data from World of Wargraphs into 4 sections for each Hard Mode activity (PvE, PvP) and graphed them according to role and function within that activity. In theory, people familiar with each class should be able to pinpoint certain changes that were made either to the class or to the content that swung the herd into favoring certain classes over each other. As I look over these graphs, I can’t help but wonder about things like raids which favor absorb healers vs throughput healers, tiers which favor more tanks versus fewer tanks, encounters which reward cleave specs versus multi dot or single target specs. PvP is a different set of stories, presented in a similar fashion. It’s amazing, looking at these graphs, to see the effects of certain changes in gameplay. Fix the bug in Spirit Shell, change how Vengeance works in PvP, and watch players switch in high end play. Arms is a roller coaster that is currently going off the tracks in PvP. The BM/MM flip is startling to see. All of these changes are likely tied into changes in each patch. It’ll be neat to see if folks can correlate the data with the changes. First, there appears to be a lot more spec data in here than in previous census posts, though really it’s the same data presented over time. I don’t think a popular class being popular in a hard activity is really all that unusual. A small class like Monks or Rogues are going to be a smaller piece of the hard mode pie. It’s when an unpopular spec is popular at an activity – or vice versa – that I think it’s worth standing up and taking notice. 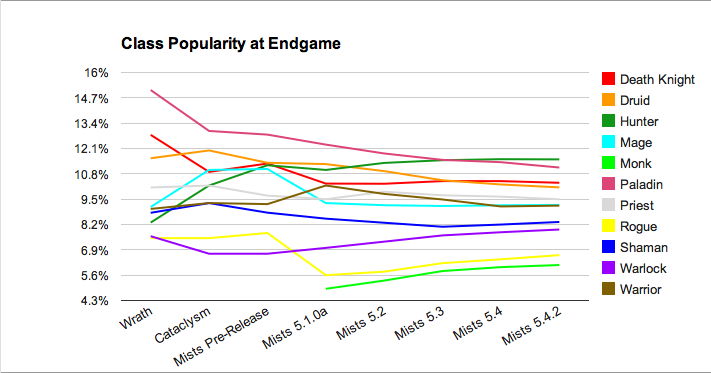 Take a look at the spreadsheet and see where there’s huge deltas between the general endgame population and a given activity – that’s where there’s something going on, something good or bad. Second, take these numbers with a grain of salt. They represent the movement of the masses, and while they might help shed light in to why people are playing – or not playing – a class, they’re not a determiner of your own personal performance or enjoyment. If you’re not chasing heroic mode achievements or 2200+ ratings, the spec data shouldn’t make you feel bad about your choices. But there’s a flip side, as I found out in Cataclysm – sometimes it’s reassuring to know when you’re struggling with a class that it’s not just you. If you’re not feeling your Warrior right now, or are suddenly really digging your Shaman – well, other people are too. Really like your Priest? There’s a reason for it. You’re not alone, there are reasons why people are making these kinds of decisions en masse. I’ll leave it up to you to level those alts and figure out which ones you enjoy the most. I wonder if the Holy Paladin representation taking a nosedive and Resto Shaman getting a huge bump is related to the amount of AoE healing this tier. By my understanding, Holy Paladins have been struggling a little as of late with AoE, and then you have Resto Shaman who were already pretty good at AoE healing (but miserable at everything else) get buffed through the wazoo. But similar to DS, there is a lot of stacking healing in this tier (though not quite to the same % it was then), which really plays to Shaman strength. Or I could be totally crazy. I don’t always make a puddle of water on the ground. But when I do, NOBODY STANDS IN IT. Although I never do Rated BGs, that fits with my informal observation in regular BGs. Warriors became the new hotness, and a lot of BM Hunters seem to have switched into Marksmanship. Frost Mages benefited from some adjustments mid-expac, and I think that carried over into PvP. Disco Priests are still prevalent in BGs, but Holy has been sighted more often. My rule of thumb is that the easiest way you can tell if you’re going to lose a BG is if you’ve got 3+ Rogues in a 10-man BG or 4-5+ Rogues in a 15-man BG. That’s too much of a damper on DPS to overcome, particularly in a random. Thanks for the data as always. Hunters are an amazingly fun class to play. They have a “fun” meta game (collecting pets, mastering traps, etc) and like you said, they remain easy to learn and relatively easy to be good at (it used to be difficult to be a bad hunter, and most bad hunters were called that becuase they couldnt do traps or similar ancillary combat tasks). I’m surprised but also not surprised that the Monk wasn’t as big a hit as the Death Knight. As all tank representation is on a downward trend this suggests less 10 man guilds are reaching latter heroic bosses compared to 25 man. Some people may say this indicates 10 man is harder, but could this be early effects of the announced 1 size Mythic difficulty?